It's hard to believe Valentine's Day is almost upon us! Where did the New Year go? We've been busy dealing with the not-so-fun end-of-year necessities (taxes) and trying to squeeze in time for the ultra-fun stuff...shopping for more vintage pieces for you! We've found some really fun and exciting stuff! Sometimes it can be hard to remember to look back at our Etsy shop often to see what is new, but there are several ways you can easily keep up-to-date. The first super-easy way to be kept up-to-date is to "Like" us on Facebook. You can visit us directly on Facebook or you can click the Facebook button on this page to the left or on our Etsy shop page just under the store name. We're constantly updating Facebook with photos of new finds and links to their Etsy listings. If you opt to "follow" and/or receive "Notifications", you will get updates in your own Facebook news feed (you can opt out of this at any time). This is a quick and easy way to receive updates on new items we've found even before they reach the Etsy shop! Then if you are particularly interested in an item before it is listed, send us a message on Facebook or a Conversation on Etsy inquiring about it. We'll fill you in on the item's details and even set up a reserved listing for you on Etsy. We are big fans of Pinterest. You can find us there pinning our favorite web pages showcasing all sorts of vintage goodness but we pin links to our own vintage offerings as well. Follow one board or all of them! If you find yourself on Etsy a lot, perhaps the easiest way to find our new listings would be to add our shop to your favorites. 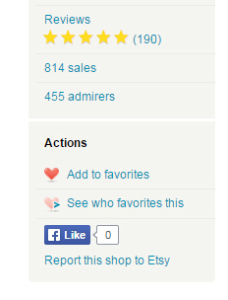 You can do this simply by visiting our Etsy shop and clicking the heart icon on the left-hand side of the page next to "Add to Favorites". We you list us as one of your favorite shops, our new listings will be displayed on your Etsy "Home" page. You will also be able to easily find us from your Etsy profile page. We'll be bringing you more awesome vintage finds so pick one or more of the above ways to stay informed of our ever-changing inventory!